A couple of friends invited us to go paddle boarding with them Sunday afternoon. Obviously, we were all over that. I had to switch gears since I was planning on having a completely lazy Sunday, but this ended up being sooo much more fun. 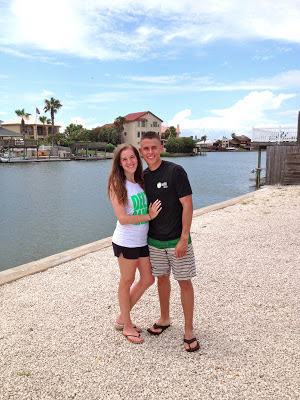 I'm so glad we went! I wish we would've gotten a group picture of the six of us, but one of our friends was kind enough to snap a couple of shots of Parker and me. 1. It's surprisingly easy. I can't do water sports to save my life- I can't water ski, knee board, and I've never tried to wake board, but I am pretty sure that would fall under the "can't do" list as well. I expected to fall off while paddle boarding multiple times, and that wasn't the case. All six of us had a really easy time standing up. With the exception of Parker pushing me off the board to be funny, it was smooth sailing. 2. Your arms will be sore the next day. Very, very sore. 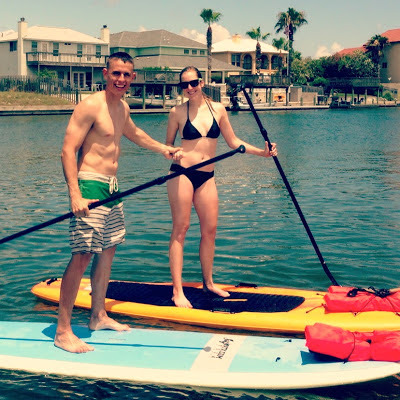 In my self-defense, we paddle boarded for four hours (a lot of that was against the wind and current), but maybe I'm just a wimp because Parker wasn't sore at all. My arms are probably the weakest part of my body, so being sore the next morning didn't come as a shock. 3. You will get sunburned if you ask Parker or me to apply your sunscreen. 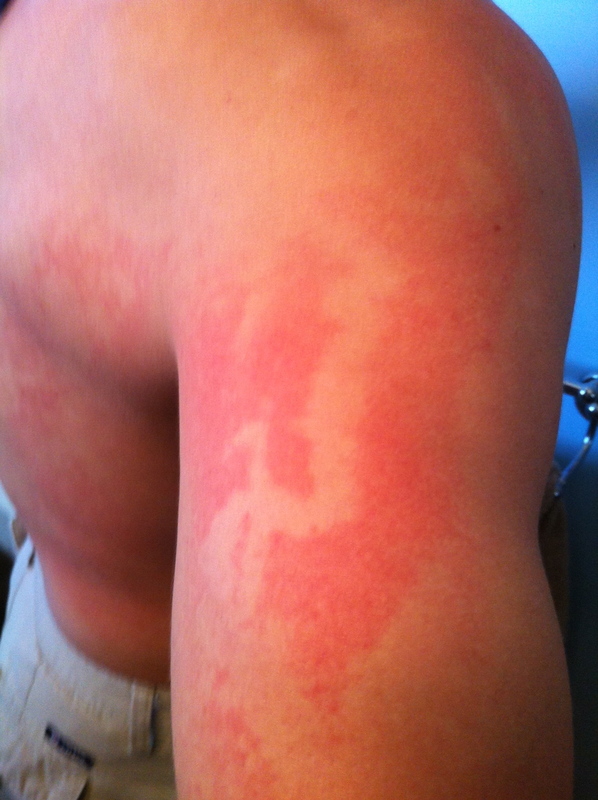 Parker and I each applied spray on sunscreen for the other. Let's just say we failed epically. The spray can was running low and we did a poor job of rubbing it in, so we each have very sporadic sunburns. 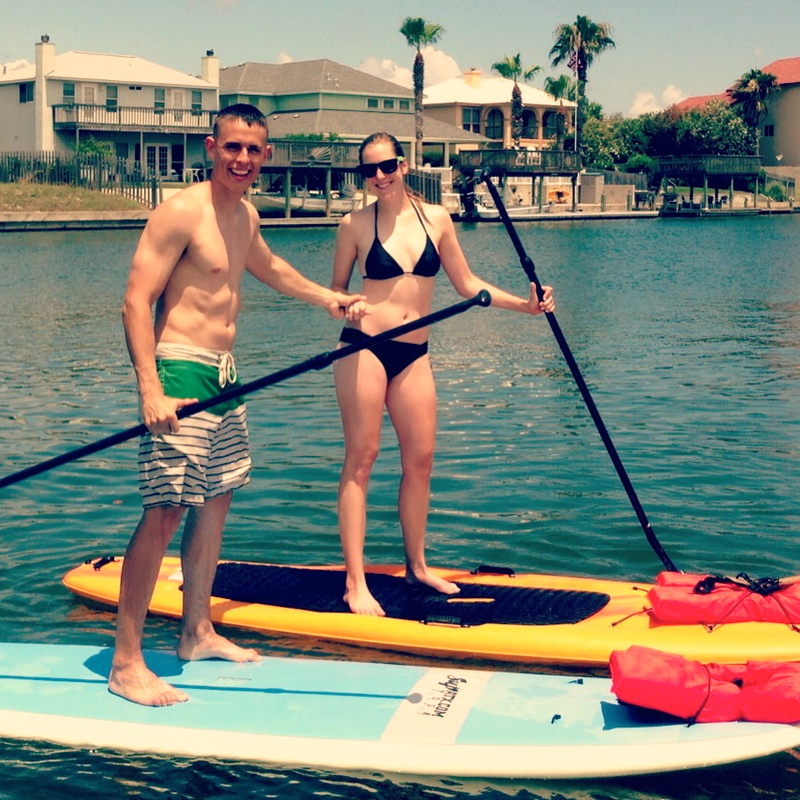 Aside from the soreness and newly heightened chance of skin cancer, paddle boarding was a blast! We had so much fun with our new friends, and it was great to get out there and do something different. If you ever have the opportunity, I highly recommend it! 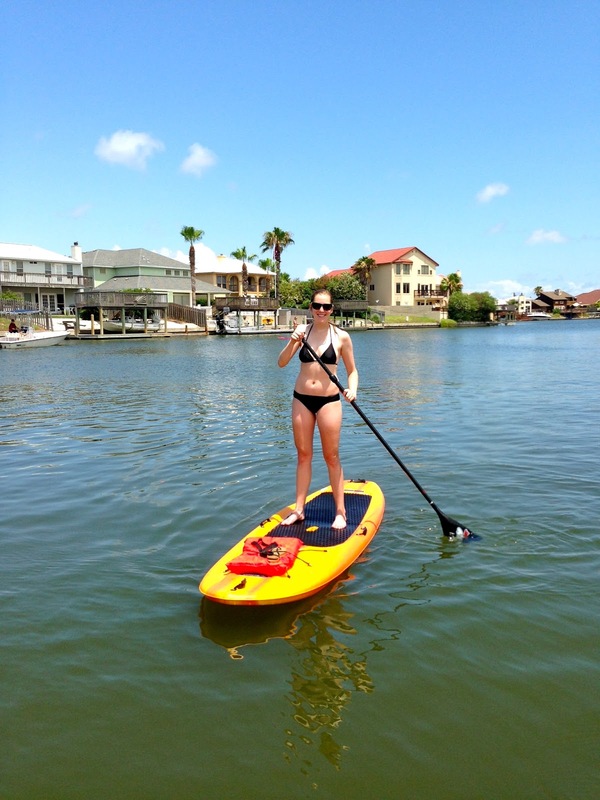 I have yet to try paddle boarding and cannot wait to do so! It looks like such an amazing workout. I refuse to do it in Boston on the Charles for fear that I fall in the filthy water! We are going this weekend!! I can't wait! It's something both of us have been wanting to do for a long time, it looks like so much fun! Now I really want to try this. Sadly it won't be in Belgium so I'll have to wait to give it a try until I go to a tropical country on holidays but it seems so much fun. 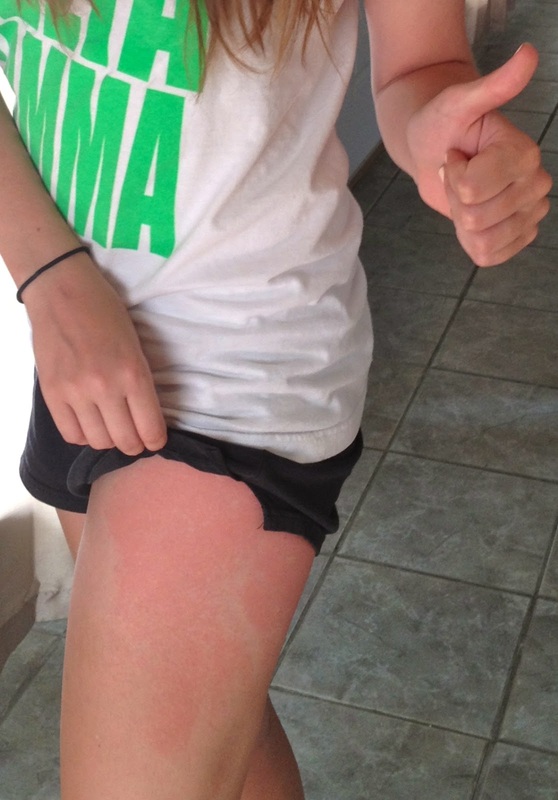 I'll remember to put on enough sunscreen the next time I go out because auwtch those burns look so painful. Fun! 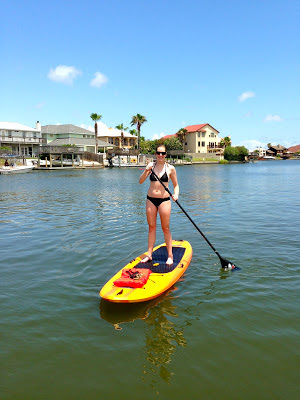 I've been dying to try stand-up paddleboarding ever since I moved to Charleston. That looks awesome! I've always wanted to go paddle boarding. Those sunburns look painful!! That looks like so much fun!! I want to try it now! I've always wanted to try paddle boarding! And I hate the spray on sunscreen for that very reason! Sounds like a blast to me! The sunscreen thing always happens to me....never my hubby...I guess he forgets that I am so fair skinned that even minutes in the sun can end in a sunburn! I'm so glad you wrote about this! I've been wanting to try paddle boarding for quite some time now but was worried I'd make a fool out of myself! You've given me confidence haha! I see discounts on Paddle boarding all the time on Groupon and the Husband and I always want to try, but haven't got around to it yet. Looks like to much fun! Minus the sunburn! So much fun! Do you think Jenny would like it? Last summer I was in Austin and I saw people paddle boarding with their dog sitting on the front of the board! My pup would never sit still but Jenny seems better behaved. She'd be so cute in a little puppy life vest! AHH I've always wanted to paddle board!! And OOOWWIIEEE on that sunburn! yikes! I would love to try paddleboarding one day! Looks like fun! Minus the sunburn I know I would get haha! !